These Slow Cooker Crispy Baked Chicken Tacos feature delicious chicken taco filling made in the slow cooker, and then the tacos are baked until they’re nice and crispy! This looks like a great meal forTaco Tuesday! Click to see The BEST Instant Pot and Slow Cooker Chicken Drumsticks Recipes! These Crispy Baked Chicken Tacos from Mountain Mama Cooks sound to me like something every taco-loving family would like! They were a big hit with the family of my sister Pam, who tried them when I first featured this recipe. Sometimes good ideas are so simple you immediately wonder why you never thought of it! For these Slow Cooker Crispy Baked Chicken Tacos from Mountain Mama Cooks, it’s the idea of filling corn taco shells with delicious chicken taco filling that you’ve made in the slow cooker and then baking them until the shells get crispy! Kelley says that crispy shells are “the real deal” in these tacos, and I’d have to agree that she’s on to something! And wouldn’t this make a wonderful Taco Tuesday dinner without much work for the cook? 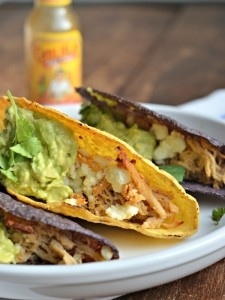 Get the Complete Recipe for Slow Cooker Crispy Baked Chicken Tacos from Mountain Mama Cooks. I love the idea of this slow-cooked filling inside something so crunchy. My grandkids would adore it! Lydia, I'm thinking this simple step will make every kind of tacos better! Thanks for sharing the recipe, Kalyn! Baking the tacos is makes the shells crispy and nutty. Such an easy trick and so, so good! Made these today….LOVED them! I will definitely make again. Put regular Mexican mix of cheeses for Kelly, he was Leary of the other cheese. I made one with feta as I didn't have cojita…..it was delicious either way!